Saturday September 14th the Geocachers of Washington County (MD) in association with the Hagerstown Washington County Convention and Visitors Bureau kicked off with a morning event the Washington County Maryland GeoTrail. The really interesting and educational trail consists of thirty-five (35) geocaches placed at points of interest all over the County. Caches can be found in National, State, County and Town parks as well as at Museums, Wineries, Historical sites and places of natural beauty. You can also earn a trackable geocoin which will be awarded to the first 500 geocachers that complete the WCG and submit their passports of completion. What made our trip up to this area even more special (other than being with Jim & Lynne of jtmlam59) was an unanticipated coincidence. Without really planning it, this trail opened on the same weekend as most of Washington County Maryland was having a major reenactment weekend. Not only did we get to tour a really gorgeous part of Maryland we also got to visit numerous historical sites with characters of all sorts manning each and every site, dressed in uniforms, dresses, etc of the 1860's. Everywhere we went we were approached by ladies or soldiers offering assistance and ready to answer any and all questions we had. Thank goodness the temperatures were in the lower 70's as I cannot imagine being in those wool uniforms of huge southern dresses if the temperatures had been in the 80's or 90's. Field Hospital (Pry House) [GC4EFXE] - served dual roles during and after the bloody battle at Antietam in September of 1862. It served both as headquarters for Union Commanding General George McClellan and Union Medical Director Dr. Jonathan Letterman. Antietam would be McClellan's last battle command, reflected in his timid and piecemeal approach to Bobby Lee. To Letterman's eternal credit, Antietam, and the Pry House, is arguably the birthplace of modern battlefield and emergency medicine. It is thus appropriate that the Site, while associated with Little Mac, is today the Pry House Field Hospital Museum, a sub-site of the National Museum of Civil War Medicine. Doubleday Hill [GC4EFW3] - In 1861 Civil War times, Union Major Abner Doubleday led the former Fort Sumter Battery E, 1st U.S. Artillery to Williamsport to guard the vulnerable Potomac River crossings. It was there that he built a battery at the edge of a piece of land that was, and remains the town's cemetery. It was also the highest point in Williamsport. Three siege guns were installed and Doubleday's men held the position for several months. Devils Backbone Park [GC4EFW1] - Opened to the public in June of 1966, Devil's Backbone is the second oldest of Washington County's parks. 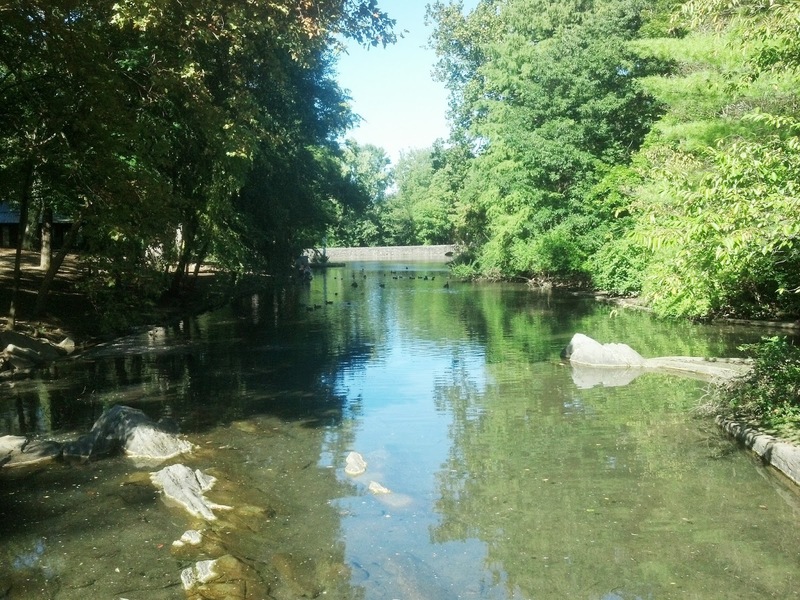 The nine acre park includes a footbridge across the Antietam Creek, which divides the park, providing access to the"island" section of the park as well as to a nature trail which ascends to the summit of the ridge from which the park takes its names. Byron Memorial Park [GC4EFY0] - one of the loveliest parks in Washington County. The park is the home Concococheague Little League, the Williamsport Pool & Community Center, the local Boy Scout Troop, and Williamsport Library. Bowman House [GC4EFVK] - the Bowman House is a two-story log structure typical of many log dwellings of the early 1800's. It is described as L-shaped, the main body being 28 feet in width and 21 in depth. The kitchen wing measures 21 by 12. Typical also is the hewed V-notch construction which is readily visible at the exterior corners. Beaver Creek School [GC4EFVB] - is an historic two-room schoolhouse dating to 1904. The school was in operation until 1961 at which time ownership of the schoolhouse was passed on to the Washington County Historical Society. Give 'Em All Three Barrels [GC4EFVT] - This multi-cache is located in small but well-situated Shafer Park in Boonsboro. The short stroll-about encompasses the founders, a time capsule, and artifacts of several American Wars. The posted coordinates lead to the first of three historical monuments. M3A1 "STUART" [GC4EFWD] - Placed with permission of the Funkstown American Legion, there is plenty of parking on site. This site memorializes those who have served this county in uniform and those in uniform who made the ultimate sacrifice with their lives. Rose Hill Cemetery [GC4EFXJ] - Founded in 1865, Rose Hill Cemetery was the first place where local residents could be buried regardless of their race or religious preferences. Many who were interred in family or church plots were moved and re-interred at Rose Hill. The names on the gravestones in the cemetery are a 'who's who' of Washington County history. Among the thousands that rest here are senators, congressmen, governors and nearly 2500 Confederate soldiers who were killed at the Battles of Antietam and South Mountain. Rose Hill has thousands of artistic and historic statuary and markers. The "Statue of Hope," the "Sacred Heart" and a marker for the dog Rollo are several of the many unusual statuary to be found there. Wash. Monument St. Pk. 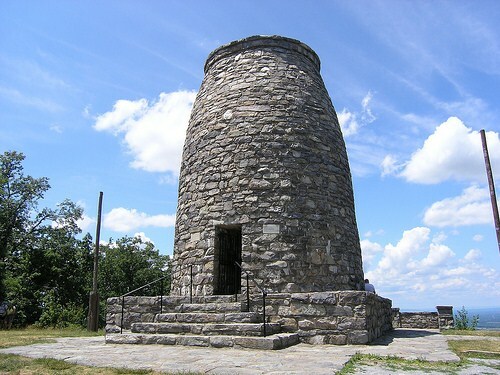 [GC4EFXW] - Located atop scenic South Mountain, Washington Monument State Park is named for the first completed monument dedicated to the memory of the country's first president - George Washington. 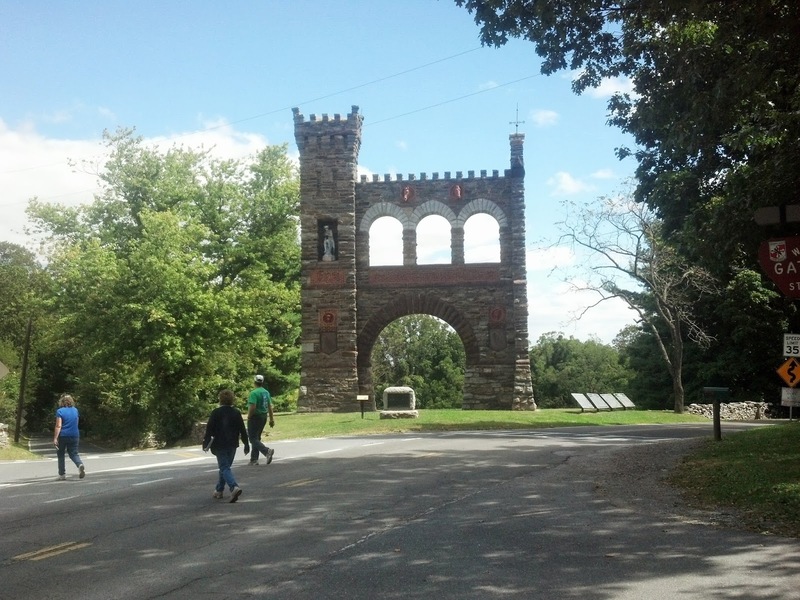 The Washington Monument is a rugged stone tower that was initially erected by the citizens of Boonsboro. This has got to be one of our favorite geocaching trips. The groups that coordinated in getting these caches in place did a fantastic job. Plenty of historic sites to visit and the scenery is fantastic!!! We will definitely be back not only to finish the rest of the geotrail, but also just to spend more time at some of the sites along the way. Thanks again (to all) for putting this geotrail together!!! Thanks for your glowing testimonial. It was nice to meet you at our event. Our team of seven hiders worked long and hard on this one. It is gratifying to read about your experiences in Washington County. My significant other and I were the area for the weekend. We did nine of these on a Saturday afternoon. At the end she commented on how great a day we had. That's when it occurred to me that we did not see a single light pole or guard rail all day. I got eleven more on the "scenic route" home on Sunday. We plan to get many more of them. It's a great series. August 2013 - What a fantastic month!! !